Okay, enough talk about buns! Let’s get to why they’re so special! Get your stand-mixer bowl and put lard, sugar and salt in it; pour boiling water over and set aside. Next, sprinkle yeast over the ¾ cup warm water for about 10 minutes until foamy. Add yeast mixture into mixer bowl with lard, sugar and salt and add 3 cups of flour; mix until smooth (I use my dough hook for everything). Add 1 cup of milk and 2 eggs and beat until smooth. The next step in the original recipe is “keep adding flour and kneading”. For me, I kept adding flour, 1 cup at a time until elastic and smooth, which was about 8 more cups of flour. I recommend doing just that – add 1 cup at a time; the dough should form a ball, not be sticky, but elastic and smooth when enough flour has been added. You may been more, you may need less! Cover and let rise in a warm spot until double, about 1 hour. Punch down, cover and let rise again another hour. Take ball of dough and divide into equal pieces. I’ve shared in detail how I divide my dough and shape them in this post, but you’ll need to divide even further as this is a big recipe! Grease a pan and place buns on to rise another hour or so and bake at 400ºF for 12-14 minutes until golden brown on top. 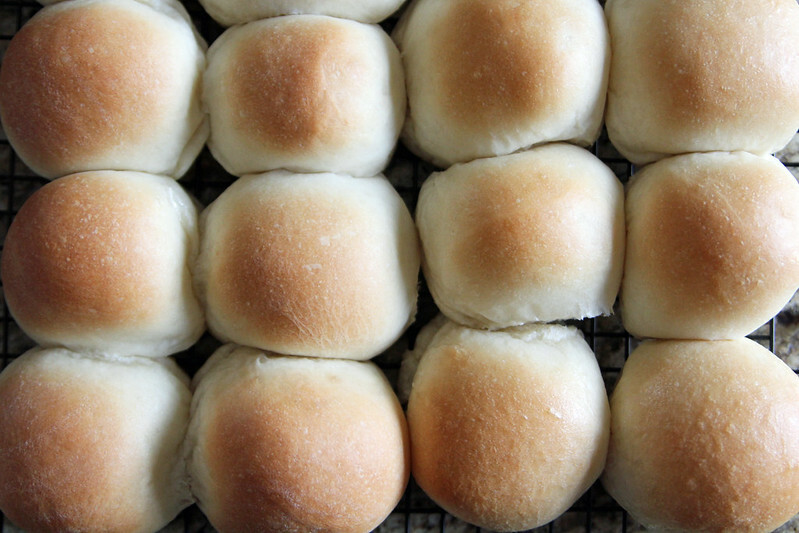 I like to brush melted butter on the top of these buns; immediately move to cooling rack and enjoy! A recipe from our farming community cookbook. 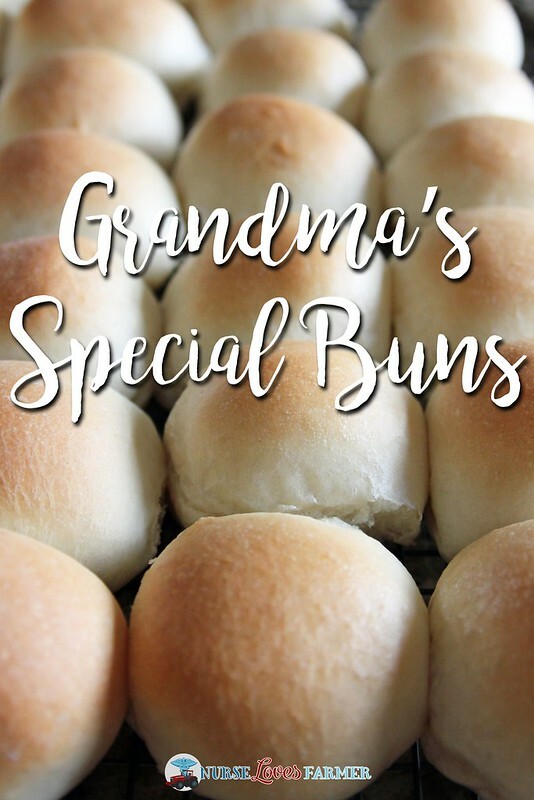 Too good not to share "Grandma's Special Buns"! Put lard, sugar and salt in stand mixer and pour boiling water over and set aside. Sprinkle yeast over the ¾ cup warm water for about 10 minutes until foamy. Add yeast mixture into mixer bowl with lard, sugar and salt and 3 cups of the flour, mix until smooth (I use my dough hook for everything). Add 1 cup of milk and 2 eggs and beat until smooth. Add the remainder of the flour (8 cups), 1 cup at a time until elastic and smooth; you may need more or less. The dough should form a ball, not be sticky, but elastic and smooth when enough flour has been added. Cover and let rise in a warm spot until double, about 1 hour. Punch down, cover and let rise again another hour. Take ball of dough and divide into equal pieces and place on greased pan to rise another hour or so. Bake at 400ºF for 12-14 minutes until golden brown on top. 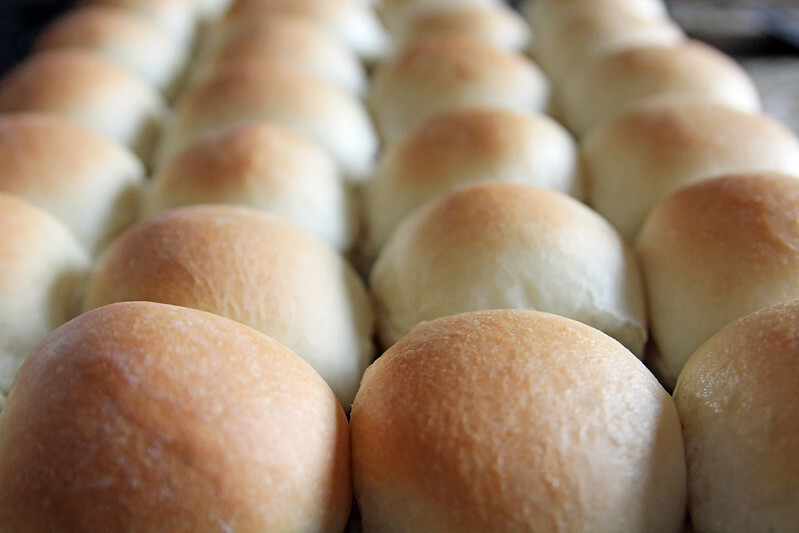 I like to brush melted butter on the top of these buns; immediately move to cooling rack and enjoy! These freeze really well and it's recommended to freeze them the same day once they have cooled. I half the recipe when I make for my own family and freeze a dozen or so for later! I hope you enjoy these, my kids LOVE them!